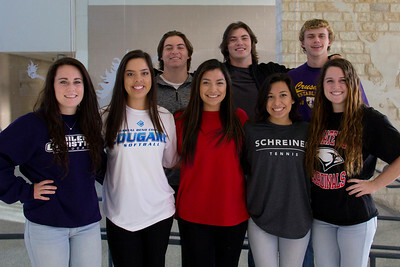 A total of 8 seniors from New Braunfels High School signed letters of intent today to play for the college of their choice next fall. The student-athletes’ teammates, family and coaches joined them for the official signing ceremonies at the school. 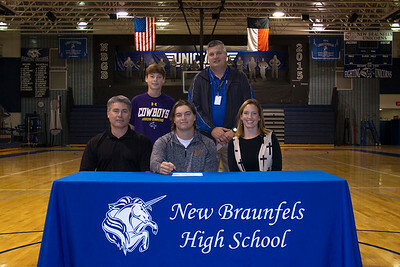 Brandon Kesselring signed a letter of intent to play football at Hardin-Simmons University in Abilene, Texas. Hardin-Simmons is a Division 3 university in the American Southwest Conference. Kesselring’s athletic honors include being named 1st-Team All-District. He is the son of JP and Dawn Kesselring. 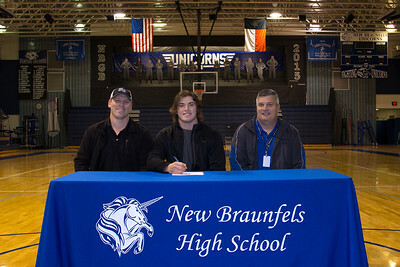 David Smullen Jr. signed a letter of intent to play football at Southeastern Oklahoma State University. Southeastern Oklahoma State is a Division 2 school in the Great American Conference. His football honors include First Team All-District and named to the San Antonio All-Star Game. 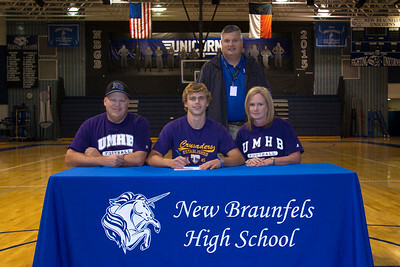 He is the son of David Smullen Sr.
Dillon Hanson received an Academic/Athletic scholarship to play football at the University of Mary Hardin-Baylor in Belton, Texas. UMHB is a Division 3 university in the American Southwest Conference. Hanson’s athletic honors include being named First Team All-District, San Antonio Area All Star Team Player, New Braunfels Varsity Defensive Player of the year 2015 and he was also a varsity track 2015 area qualifier and Texas Relay’s Qualifier for 2015. He is the son of James and Wendy Hanson. 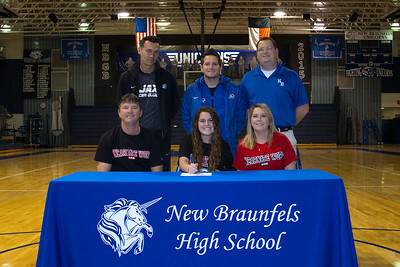 Brooke Hanson received a scholarship to play soccer for the University of Incarnate Word in San Antonio, Texas. Incarnate Word is a Division I school in the Southland Conference. Her soccer honors include Express News Newcomer of the year her freshman year, 1st Team All District – sophomore and junior year, All-State 2nd team – junior year and Express News All Area Super Team – junior year. She is the daughter of Melanie and Tommy Hanson. 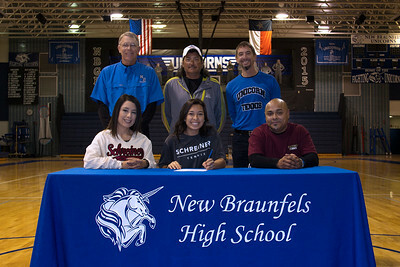 Iris J. Montero signed a letter of intent to play tennis at Schreiner University. Schreiner is a Division 3 university in the Southern Collegiate Athletic Conference in Kerrville, Texas. Her athletic honors include being on the 2013 Team Tennis 5A State Champ team, 2014 Team Tennis 6A State Finalist, and the 2015 Team Tennis 6A State Champions. She is the daughter of Rigo and Rosalinda Montero. 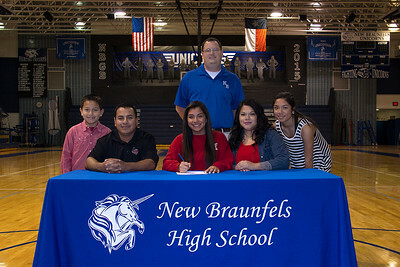 Myranda Rodriguez signed a letter of intent to play soccer at Sul Ross State University in Alpine, Texas. Sul Ross is a Division 3 University in the American Southwest Conference. 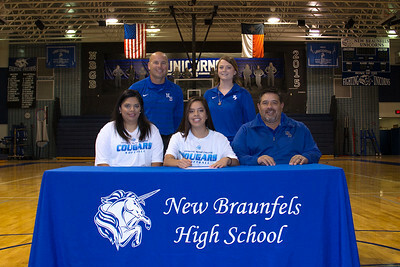 Rodriguez, a 3-year letterman is the daughter of Senaido Rodriguez Jr. and Carmen Martinez. 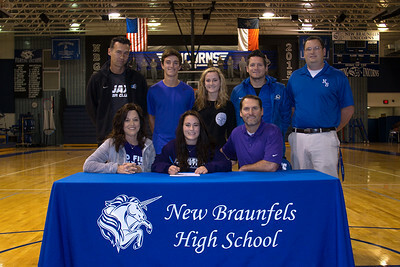 Peighton Starch received a scholarship to Abilene Christian University and will be playing soccer. ACU is a Division 1 school in the Southland Conference located in Abilene, Texas. Her athletic honors include being a 4-year varsity starter, named All-District all four years, and named San Antonio Express News Area Player of the Week. She is the daughter of David and Kathy Starch.